Mommy Jane and Little Angel went to AK Noodles House at Tropicana City Mall for a steamboat review session. 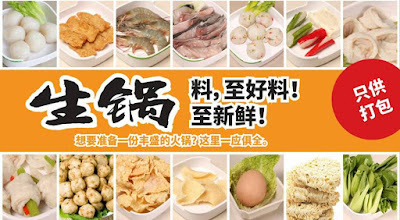 AK Noodles House had introduced Special Steamboat Package for take-away only. A good news to us since Chinese New Year approaching and Mommy Jane and family will normally prepare steamboat as our reunion dinner at the comfort of our home and also due to congestion at the restaurants. This take-away packages is a good option so that we no need to rush eating outside and there is sufficient place to accommodate everyone in the family. 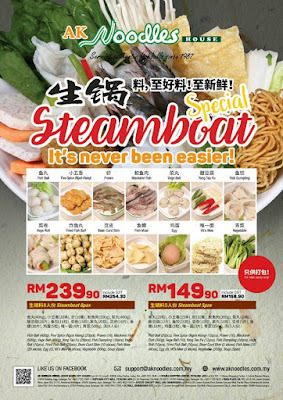 There are 2 packages available for Steamboat Special take-away at AK Noodles House. You can choose to have Steamboat package for 5 persons at RM149.90 (Plus GST at RM158.90 nett) or 8 persons at RM239.90 (Plus GST at RM254.30 nett) for all the fresh ingredients as above. Customers can also choose to have Vacuum Packaging or Seal Packaging for the Steamboat Special to maintain its freshness of the ingredients. 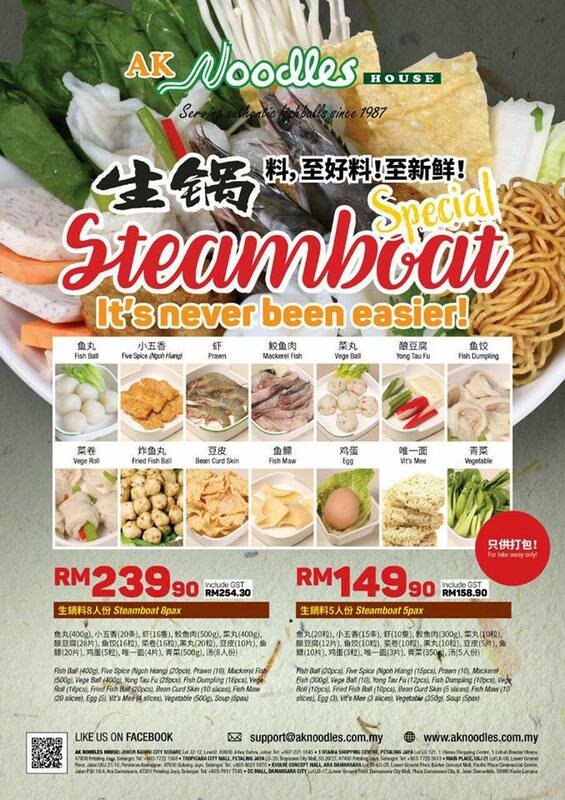 Plan your lunch or dinner now for a take-away of the Special Steamboat package at its 7 outlets now i.e. Tropicana City Mall, Main Place USJ 21 Subang, Evolve Concept Mall Ara Damansara, DC Mall and 1 Utama Shopping Mall. For more information and details, you could check out their website at www.aknoodles.com.my or you could follow them at their facebook at www.facebook.com/AKNoodlesHouse.Official for more information. Mommy Jane and Little Angel were overloaded with freshness of the fish products that best to have it as Steamboat. Their special made pure fish balls contains no preservative, crispy and delicious. Mommy Jane believes that more Chinese will opt for the take-away package for a hassle free reunion dinner that keeps the family bonded. The feast is sumptuous to symbolise a good start of the new year. With the ingredients of the steamboat added in the bubbling broth, whipping up every possible combination of prosperity, wealth, longetivity and a better health in the soup for everyone. Hope all of you will enjoy the AK Noodles steamboat as much as we did. Amanda, enjoy your next review. I'm sure you'll love it too. They have steamboat too? Thought just noodles. Cindyrina, they just launched the steamboat but for take-away only. Nice steamboat food. Want to go there too. Linda, the steamboat is for take-away only. You can bring it home to have it as your reunion dinner. Wow steamboat concept, i love it. Looks fresh and nice. Sarina, indeed fresh. I love it too. Emily, you can take-away, bring it home and prepare for the dinner. Fuss free. omgosh it looks so delicious la!!! Need to try! Claudi, you should try it out too. Simply fresh. Rane, you can try their noodles there with their fresh fish balls. Then take-away the steamboat for dinner. Really good. Fateen, I love their fresh prawns too. Look at those prawn! All I can see is steamboat goodness on this post. Aqalili, enjoy your steamboat at the comfort of your home. May, agreed with you. CNY times, best to have steamboat. Looks so yummy! I haven't try AK noodles before. Will check it out. Shini, you should try it out. Order their fish balls and fish cake are the best. Candace, the package really worth it with the fresh ingredients given. Sara, you can order for take-away and have it with your family and friends. Wow never know AK Noodles promoting Steamboat. Next time I can try on it. The price is affordable too. Betty, they just launched the steamboat package for take-away only. Can have it with your family at home.